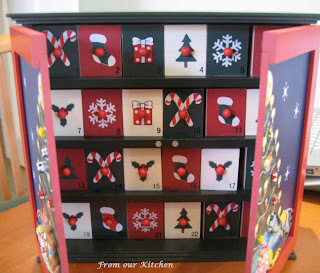 When I was growing up in Malaysia, I had never heard of the Advent Calendar. 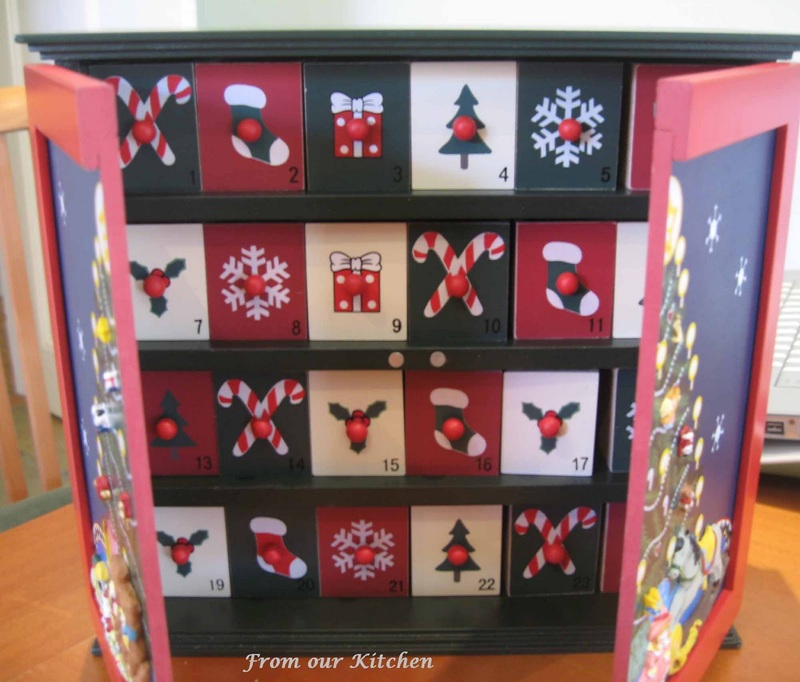 In Australia, it is popular to buy cardboard Advent calendars from the shops filled with a piece of chocolate or sweet for each day leading up to Christmas. Advent is a time of preparation, for the coming of Christmas. We used to buy Ashleigh one of those chocolate Advent calendars, but somehow I felt it was not ideal way to prepare our girls for Christmas. A few years ago, we bought a wooden Advent Calendar box from the Christmas stall at Ashleigh's school Spring Fair. I love the box. 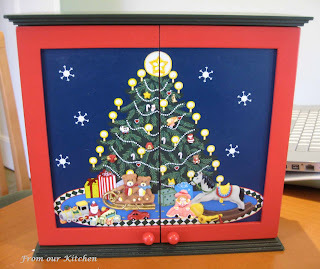 There are 24 little drawers/boxes representing the 24 days till Christmas Day, although Advent usually starts before 1 December. This year, I am much more organised and have prepared the boxes. Each box contains something varying from lollies, chocolates or little tasks the girls can do in preparation. I know I should not place any lollies or chocolates, but there must be some incentives for the girls. I can't wait to see Ashleigh and Caitlin's faces when they open the little drawers. This is gorgeous!!! Very Packed to the Rafters like...a legacy or a tradition your kids can carry on for their kids too. I'll be wanting to look out for something like that too. Just starting my kids with the chocolates this year. I have to keep reminding them that Christmas is NOT all about Santa or presents or chocolates..but hey! they're kids and probably do not want to be reminded constantly that Christmas is more than presents! What a beauty of an advent calender. My son would love it! what goodies did you put inside those little drawers? it's very very pretty. Tania: In the drawers, I have placed some lollies, jellybeans and chocolates. On some days, there are no sweets, just a little note with a task or phrase for my two girls. Tasks vary from reading the story about the birth of Jesus, giving a smile to everyone...etc. Little things to remind them that Advent is not about sweets but preparing for Christmas.